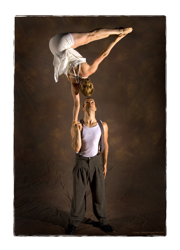 Duo Voltart is composed by Damien Boudreau and Genevi�ve Cliche, two professional circus artists from Montreal, Canada. They have been performing on international stages since many years now and moslty work for corporate and special events inetrnationally. It is both their passion for hand to hand work that have led them to present this unique and touching acrobatic act.